North Korea launched a mid-range ballistic missile this weekend, the first launch of such a missile typically loosed from submarines, U.S. officials said. Once again, world leaders correctly condemned as another provocative action aimed at weakening regional stability. But they’ve said this before, many times over. At this point, the U.S. and its allies have almost run out of options for keeping the Hermit Kingdom in line. Citing North Korean state media, CNN reports that Pyongyang launched a mid-range ballistic missile called the Pukguksong-2. It flew 300 miles, farther than it has in the past, before landing in the Sea of Japan. It was the first launch of a land-based test involving an intermediate-range missile. 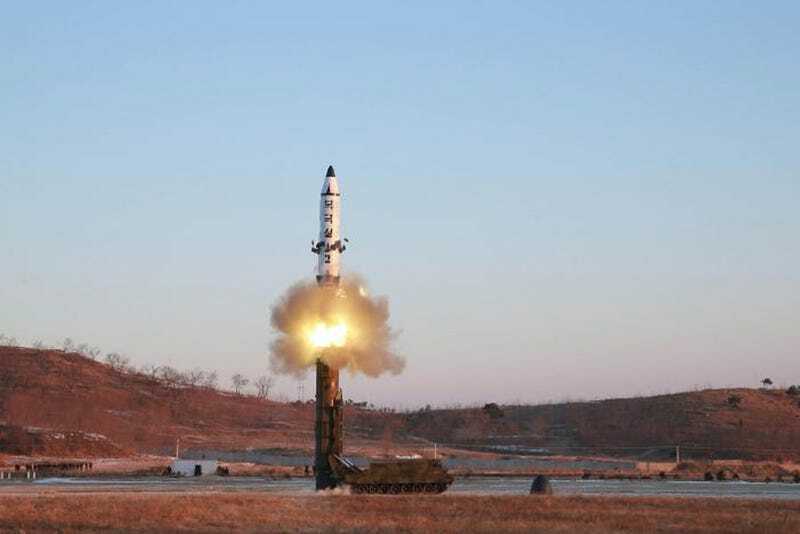 What makes the Pukguksong-2 test unique is that the missile is already built with solid fuel inside, which takes less time to to fuel on the launch pad. (UPDATE: As Dr. Strangegun points out, solid-fueled rockets don’t take any time to fuel on the pad because they already have their solid rocket fuel inside. Still, no time is technically less time than any amount of time it would take to fill up a liquid-fueled rocket.) This makes it harder to detect an imminent launch. Solid fuel missiles require far less infrastructure than liquid ones. For example, liquid ballistic missiles require “a garrison, fuel storage tanks and support vehicles to launch, which can be identified with imagery,” experts told CNN. It is definitely a technological advancement in North Korea’s ballistic missile capabilities. The test launch was North Korea’s first since President Donald Trump took office in the U.S. and will almost certainly be seen as a test of his willingness to be tough on the country, as vowed during his campaign. But while condemnations from world leaders were swift, none really said anything they haven’t said before. NATO’s response on Saturday reads pretty much like the one it released in December when North Korea conducted a missile test. Trump’s response to the test on Saturday hardly made it clear that the U.S. and its allies were not to be trifled with. “I just want everybody to understand and fully know that the United States of America stands behind Japan, its great ally, 100 percent,” he said, as Japanese Prime Minister Shinzo Abe stood next to him. While it is easy to take jabs at Trump for his lack of foreign policy acumen, there really wasn’t much else he could say. For years, world leaders have wrestled with what to do with with Kim Jong-un, North Korea’s reclusive leader. UN sanctions levied against Pyongyang haven’t slowed the regime down, either; North Korea conducted 20 ballistic missile tests in 2016 alone. So, what will stop North Korea from trolling the world with its unpredictable ballistic missile tests and bring them back to the negotiation table to discuss ending its nuclear weapons program? No one exactly knows for sure, but one thing is for certain: we have to keep trying to negotiate with them. War is not an option, even if that war is one North Korea would inevitably lose. One of the toughest dilemmas in dealing with North Korea’s leadership is that few people know how key members of its inner circle think and what their true endgame is. China is Pyongyang’s closest ally, but even Beijing doesn’t have a lot of influence over its leadership. A military approach is out of the question because the consequences are not worth it. The first is a fear that a large number of North Korean citizens, seeking to escape a humanitarian disaster and physical danger would begin coming across the border into China. Indeed, the flow began during the famine of the 1990s and has continued at rather low levels until this day. What I’m talking about and what Chinese leaders would fear is an outcome that is orders of magnitude larger. Some observers have predicted that under certain circumstances we could be talking about several million people. Even 10 percent or one percent of that would destabilize Northeast China and place a serious strain on the authorities. South Korea has a superior military that can easily defeat North Korea in a country-to-country war (and Pyongyang knows it), but Seoul has no interest in an armed conflict because it would suffer enormous losses—even in a win. And no one doubts that Pyongyang would use what nuclear capabilities it has to fight to the death. The U.S. will deploy a Terminal High Altitude Area Defense or (THAAD) missile defense system later this year to help ensure South Korea can defend itself against an aggressive missile strike from North Korea. THAAD is a defense system that is designed to shoot down short-, medium- and intermediate-range missiles in their terminal phase, which is the last chance a missile can be hit before it reaches its target. Japan has also beefed up its military spending for 2017 in response to North Korea’s ballistic missile tests. This is pretty much all that can be done militarily without driving Pyongyang into even more paranoia over fears of an full-scale invasion. The only thing left to do is what has been tried before: diplomacy. So far Washington has to keep talking to Pyongyang. The Washington Post reported last year that former U.S. officials and nuclear weapons experts engaged in highly secretive talks with high-ranking North Korean leaders dubbed “Track II” dialogues. The meetings were not official, though. America hasn’t held formal talks with North Korea since 2011, when Kim took over after his father died. Reviews of the meetings have been mixed, but Robert Carlin, a former State Department official who has visited North Korea more than 30 times, said that officials there signaled that it is open to discussing terms of denuclearization. Why not resume “Track II” talks so that such a possibility can be revisited, no matter how many grains of salt one may want to apply to North Korea’s promise? There is no guarantee that the Kim regime would accept Washington’s offer to negotiate. Moreover, even if North Korea decides to negotiate, there is no guarantee that the resulting negotiations would bring about a freeze. Sanctions against Pyongyang should be strengthened until some kind of agreement is reached. As long as the military option remains off the table, working with sanctions, contrary to analyst Shawn McFall’s claim, would be the only possible option left once diplomacy fails. Ratcheting up sanctions, therefore, has to mean more than just closing serious loopholes, including the “livelihood exemption,” and imposing a series of unilateral sanctions. Rather, most of such efforts should be devoted to disseminating outside information into North Korea and, as Dursun Peksen, Associate Professor of Political Science at the University of Memphis, argues, empowering ordinary North Korean people. Unfortunately, the effectiveness of sanctions would remain minimal at best without proper Chinese enforcement. This much-needed assistance will be forthcoming only when Beijing feels assured that its interests are going to be respected, particularly after a potential North Korean collapse. What it means is that the United States, most likely along with South Korea, will have to make some tough calls and strike a deal with China at some point. Some scholars and analysts, such as Geoff Dyer, former Financial Times Beijing bureau chief, suggest forcing Beijing to come on board through either direct or secondary sanctions, if not an increased military presence in the region. Negotiating with North Korea will be a huge headache, but the world can’t allow it to grow into a nuclear power that feels everyone is out to destroy it either. Trump has inherited a North Korea that is more dangerous than the one Obama had to deal with in 2008. So far, Pyongyang has the capacity to produce 20 nuclear weapons and it conducted four nuclear tests during Obama’s presidency. If Trump is wise, he will try to leave office someday at least attempting to ensure that the North Korea his successors deal with will be less dangerous than the one Obama left him. Yes, that would require Washington to deal with a crazy person leading a deeply unpredictable regime. But an even crazier proposition would be giving up on North Korea when diplomatic measures to bring Pyongyang to the negotiating table have yet to be exhausted. War isn’t something the U.S. can afford, and the same goes for China, Japan and South Korea. Is This North Korea&apos;s Nuclear Bomb?